The beginning of October signals the beginning of the most colourful and most beautiful season. But Oct. 1 also marked a special and reflective day for UNB's Indigenous community. Organized by Shelley Francis, director of UNB's Indigenous Nursing Program, members of the UNB community wore orange to recognize the St. Joseph Mission residential school commemoration event held in Williams Lake, B.C., in the spring of 2013. The event grew out of Phyllis' story. Phyllis, then aged six, had her shiny new orange shirt taken away on her first day of school at the Mission. It has since become an opportunity to keep the discussion on all aspects of residential schools happening annually. The official date of Orange Shirt Day is Sept. 30, this year a Sunday; UNB encouraged its community members to wear their orange shirt on Monday, Oct. 1. The date was chosen because it is the time of year in which children were taken from their homes to residential schools, and because it is an opportunity to set the stage for anti-racism and anti-bullying policies for the coming school year. "As citizens, we all have a responsibility to acknowledge the oppressive and colonial history of Canada, and participate in "Reconciliation" with Indigenous Peoples," said Ms. Francis. "UNB's faculty of nursing has been invested in this type of work for more than ten years and I am thrilled that UNB supports our efforts across all campuses." Orange Shirt Day is also an opportunity for First Nations, local governments, education facilities and communities to come together in the spirit of reconciliation and hope for generations of children to come. "As leaders, UNB is in a privileged position to promote Indigenous culture - not only on our campuses, but to the communities around us," said Dr. Eddy Campbell, UNB's president and vice-chancellor. "UNB is committed to deepening our relationship with our Indigenous communities and are grateful to them for sharing their knowledge and experience in a spirit of reconciliation." The National Truth and Reconciliation Commission has called for a bridging of the educational attainment gap within one generation, and such a call resonates with UNB as leaders in education. As part of UNB's commitment to the process of reconciliation, the university has developed its Truth and Reconciliation (TRC) Strategic Action Plan. UNB's TRC action plan was drafted in consultation with key stakeholders throughout its communities, including UNB's Mi'kmaq-Wolastoqey Centre. It identifies short- to long-term priorities for rightful recognition of Indigenous peoples and cultures on UNB campuses, which themselves lie on traditional Wolastoqey land, and aims to increase the presence and visibility of Indigenous leadership, knowledge and culture across our campuses. Contact: Shelley Francis, Director, NUTSIHPILUWEWICIK; Indigenous Nursing Program, University of New Brunswick; (506) 458-7629. 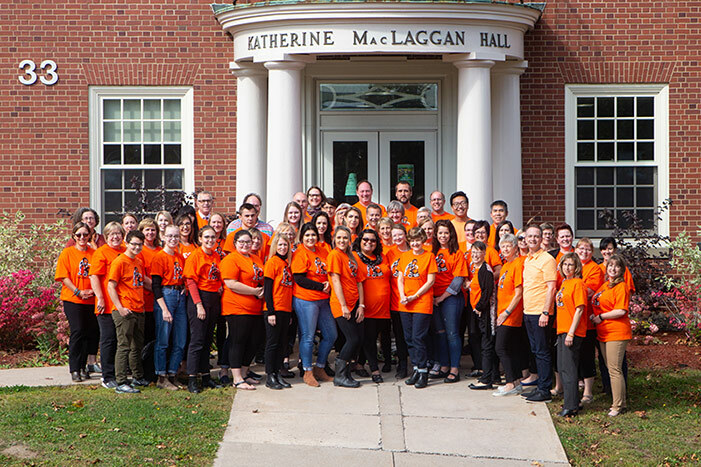 Photo: Students, faculty and staff from UNB's Faculty of Nursing, along with members of UNB's Equity Diversity and Inclusion Committee and representatives from the Student Union, gather for a photo to celebrate Orange Shirt Day at UNB.